Binary Brain Trust Review - Scam Exposed! Binary Brain Trust Review – Scam Exposed! Binary Brain Trust is yet another questionable trading software that claims to make you unreal amount of profits. Please don’t buy into it, as Binary Brain Trust is a scam! We’ve had multiple readers who fell for the scam, so make sure you read our full Binary Brain Trust review before you succumb to the same fate. A binary trading software appears out of nowhere claiming to make its members big profits for free, only to disappear within a short period of time when it loses all the investors’ money. And this is what we are seeing with Binary Brain Trust. Even though it’s still up and running today, we’ve already received emails from our readers complaining about lost deposits with the software. Binary Brain Trust scam, like many other binary auto-trader, gives a lot of fake promises in the sales video just to get you to sign up to the scam. They use a lot of buzzwords like “free” and “guaranteed profits” to get your attention, and then try to brainwash you into thinking that this is the ultimate free lunch in the world. We’ve found some powerful evidence to prove that Binary Brain Trust is a scam, so read through them and make an informed decision for yourself. Martin Clayton, the alleged founder of Binary Brain Trust claims that his software has been making every single one of its members over $5,000 per day since it was created just over five years ago (refer to screenshot). To determine if Binary Brain Trust has been around for at least 5 years, we decided to consult the whois information for binarybraintrust.co. 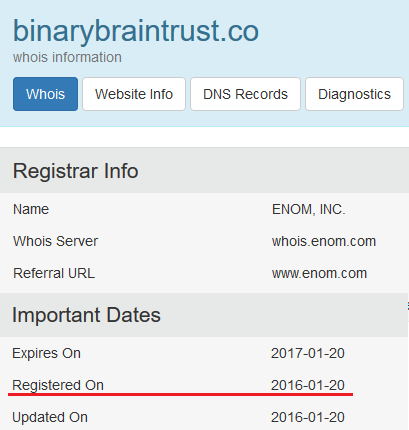 It contains all the critical information of their site, including the creation date of Binary Brain Trust. Please keep in mind that Binary Brain Trust software can only be obtained through the website itself. It’s tied to the broker account you sign up through their sign-up form in the website. There’s no other way to obtain the software even if you wanted. Turns out the website was only created on 20th Jan 2016, few months before this review was written. How is it possible for the software to have existed for the past 5 years? This contradicts the 5-year history we were told in the sales video. The truth is, Binary Brain Trust is a binary trading software scam that has just surfaced recently, and the statement is full of lies to confuse its victims. Martin Clayton has featured the bank account statements of 3 of his featured members in the sales video, and right before you sign up for a broker account, he featured them in the members area (refer to screenshot above). According to the profiles, these 3 members – Hollie McDerry, William Smith and Jin Park made astounding amount of profits from the software. This led us to investigate the real identity of these members, and the best way to do it is to do a background check based on the profile pictures they have provided. The results? We found that none of these members is real, and the photos were stolen from social media profiles. Compare these original pictures with the ones featured in Binary Brain Trust scam. 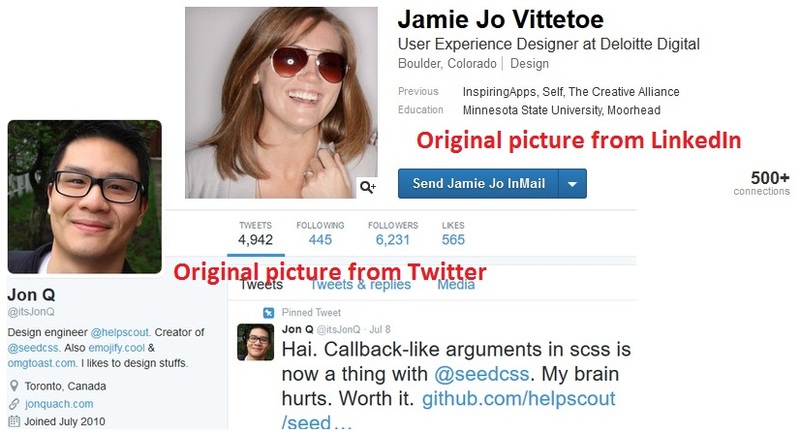 The real name of “Hollie McDerry” is actually Jamie Jo Vittetoe, while “Jin Park” is actually on Twitter with the handle of Jon Q. These people have nothing to do with Binary Brain Trust scam at all. The scammers stole these picture from these social platforms to fabricate names and identities for them. You can look for their profiles on LinkedIn and Twitter if you want to verify our findings for yourself. It goes without saying that their profile description and profits described in Binary Brain Trust website are completely fake, too. If Binary Brain Trust software really works as advertised, why do they need to use fake member pictures and fabricated names to promote the software? As much as Martin Clayton and Binary Brain Trust scam wants to keep you in the dark, they have to reveal the nature of the software somewhere in the website, or risk being on the receiving end of legal actions. Therefore, they chose to hide the truth deep in the disclaimer document, in which you can’t find anywhere in the sales material, because it’s supposed to be hidden from you. The only way to access the document is to scroll to the bottom of the page and look for an extremely small fine-print that that reads ‘disclaimer’. Even if you manage to locate it, you have to read through the wall of text to find out the truth. You can authenticate the terms we’ve quoted here against the original document on their website: binarybraintrust.co/disclaimer. Despite promising you guaranteed profits, it’s your own fault if you use Binary Brain Trust and lose all your money. NO trades have been executed using Binary Brain Trust automated system. All results shown are simulated. Why does Martin Clayton include such terms in the disclaimer? If you think it’s included as a fair warning for you, you are wrong. The sole purpose of these terms is to protect the scammers from legal actions when you lose all your trading capitals. 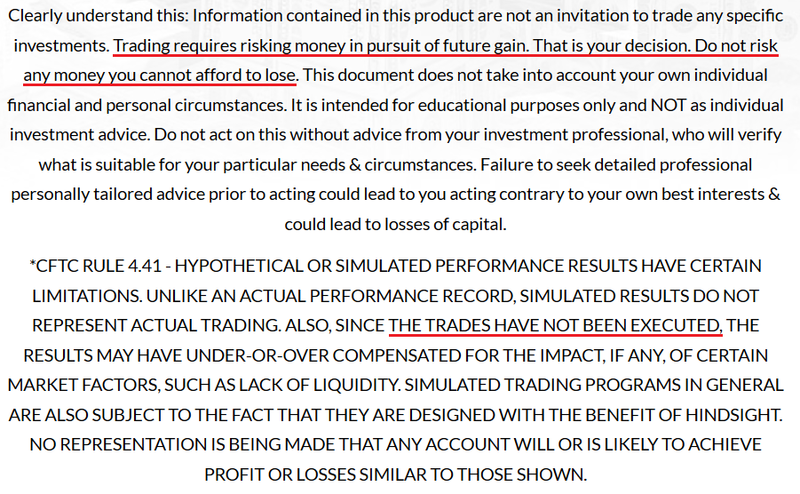 If he wanted to be upfront about the risks and the fact that no actual trading has been done with the software, he would’ve told you in the sales material. Instead, he chose to lie to you with the promises of “guaranteed profits” and by using fake member testimonials to confuse you. YES, BINARY BRAIN TRUST IS A SCAM. We strongly advise you to stay away from the scam if you don’t want to lose your hard-earned money. You’ll be better off spending that $250 deposit for a nice dinner with your loved ones than to waste it on a scam like this. 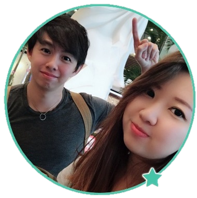 7 Figure Months Review – Scam Exposed! The Profit Hack Review – Scam Exposed! I wished I found this review earlier! I lost $300 in just minutes! What a scam!